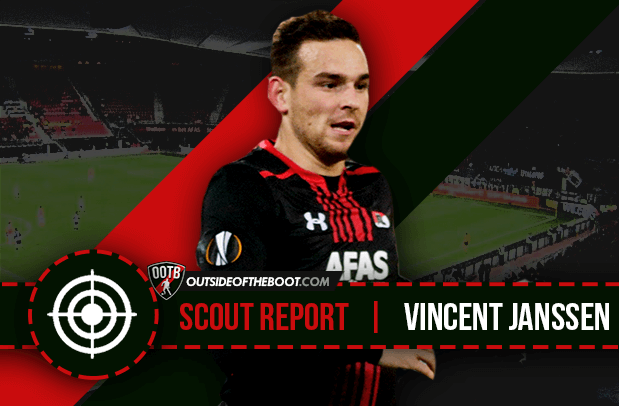 Alex Lynch writes a detailed scout report about the top scorer of the Eredivisie, Vincent Janssen. When the Netherlands were having a lot of international success in the 80’s and in the 90’s and from the late 2000’s until now, they always featured a deadly striker. With Van Basten, Kluivert, Bergkamp and more recently Van Persie and Huntelaar, the Dutch have seen a lot of great forwards over the years. But now that Van Persie and Huntelaar are ageing, and the side is clearly transitioning towards younger players, the Oranje are going to need a new man upfront. Luckily for them, they have a lot of great young talent to choose from at the moment, and one of those talented forwards is the Eredivisie leading scorer this season. He plays for AZ Alkmaar, and his name is Vincent Janssen. UPDATE: Vincent Janssen has moved to Tottenham Hotspur as of the start of the 2016-17 season. Janssen is a Dutch striker, and he was born in a small town called Heesch. He didn’t grow up near any of the big clubs in the Eredivisie. That’s why he didn’t join the academy of a top flight club until 2006, which is later than most top prospects. 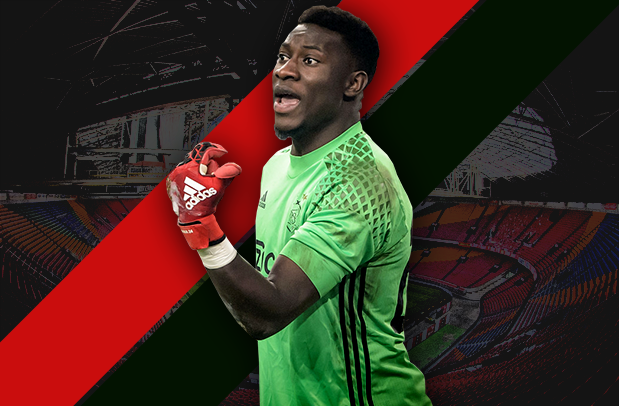 But after he joined NEC, he quickly rose through their ranks and moved to one of the biggest clubs in the Netherlands in Feyenoord. When Janssen got to Feyenoord in 2009, instead of building on the progress he made, his career came to a standstill. This is what makes Janssen a unique player, the adversity that he’s faced and the hard work that he’s already had to do. After Feyenoord didn’t give Janssen playing time, he left them for second division club Almere City FC (a club that is now known for mocking Madrid’s locker room photo). At Almere City, Janssen showed Feyenoord that he should’ve gotten a chance to play for them with his performances. At only 20 years old, Janssen dominated the second tier, with 19 goals and 9 assists, despite playing with teammates of fairly low quality. And at the end of the season, he had 22 goals and 9 assists in 38 games in all competitions. For a 20 year old, Janssen had a great season, and that earned him a move to one of the bigger clubs in Dutch football, AZ Alkmaar. In his first season with AZ, Janssen has built on the progress he made last season and Feyenoord will certainly regret selling him these days. In 25 starts for AZ this season, Janssen has 20 goals, which leads the Eredivisie at the moment. He also has three assists. Janssen has been so good, that he earned his first call up to the Dutch national team after featuring for them at youth levels. He was really introduced to the big clubs around the world when the Dutch faced off against England at Wembley. Janssen scored a goal and an assist, and he forced John Stones into making the error that led to his penalty goal. After that display big clubs are circling around Janssen. Linked with Man United, some will question if a player with less than one season of top flight experience will cut it, but with his characteristics, one feels that Janssen is certainly good enough. Janssen is more of an old fashioned striker than most of the young forwards these days, and his best characteristics show it. Just like a lot of the best Eredivisie strikers, Janssen is a terrific finisher anywhere from 6-18 yards away from the goal. Against Feyenoord, Janssen’s finishing ability was on display from all over the pitch. His first goal was a brilliant 8 yard finish, with the defender breathing down his neck. Despite not having a lot of space, he got his boot to the ball and put it in the back of the net to give AZ the lead. Later in the match, he got the ball in more of a wide position, but he made the most of it and shot the ball beautifully into the back of the net from around 16 yards out. Both goals were tough chances to convert, but nonetheless Janssen finished them both. 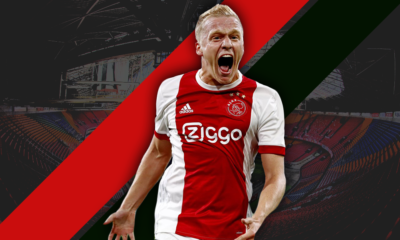 Another example of his finishing came against Ajax, when he chased down the through ball and he fired a low and hard first time finish by Jasper Cillessen. It was a great close range finish, and what had propelled Janssen into Danny Blind’s side has certainly been his finishing. Janssen is much more than a finisher despite his brilliance in that department. He’s also very strong on the ball and in the passing department. Just like the goals he scored against Feyenoord, Janssen scored for the Netherlands under 21 team as well. After collecting the ball in the box, he dribbled by the defender and finished off the chance very well. He also showed his ability on the ball for AZ on a close range finish. After the cross came into the box, he touched it onto his left foot-displaying a great first touch-and he finished the chance off like he always does. But besides dribbling, he’s also a very good passer of the ball. This was evident against England, as Janssen went to collect a through ball in a wide position, and he got to the ball (despite the fact that he appeared to foul Jagielka). After that, he looked up, and threaded a perfect ball to Narsingh who finished off the goal easily. In that instance, he showed his impressive passing ability that had allowed him to collect 12 assists over last season and this season. His final strengths are his pace and movement, which have really allowed him to score most of the goals that he scores. He constantly (as you can probably tell) uses his pace to collect through balls in wide positions and in the box, which gives him a good look at the goal. 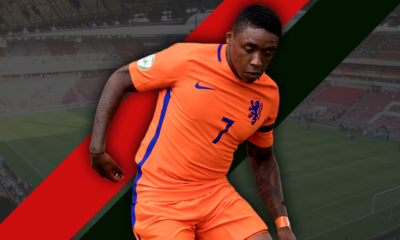 Movement is something that most great strikers excel at, and the former Almere City player certainly fits that description. But his movement wouldn’t be what it is without his pace. Let me make this clear, he’s not a Martial, Coman or Memphis with his pace, but he still has above average speed. For a striker whose 5 foot 10 like Janssen is, having quality pace is a must. And he does have it, as his pace allowed him to get separation for his goal against Ajax, and his goal for the U21 side. He also used his pace to get to the position that he got in. Part of the reason why he’s a great finisher is because of the positions he gets himself in. But without his movement and pace, that wouldn’t be possible. 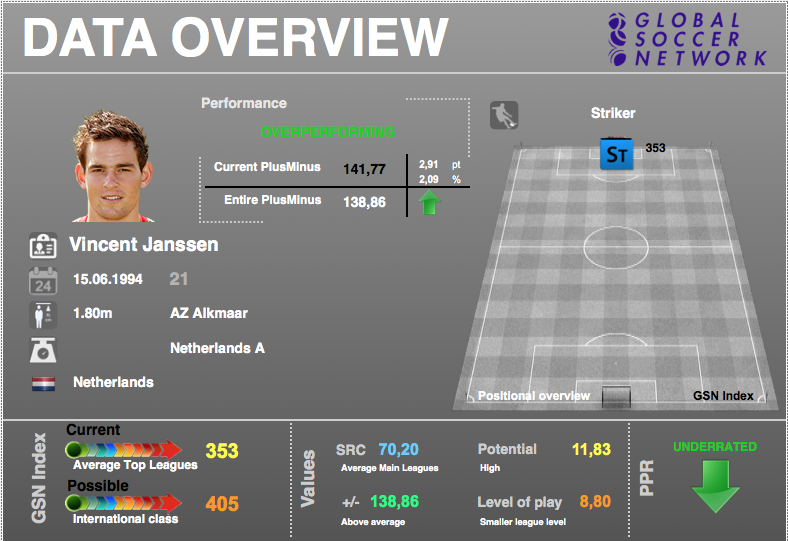 Even though Janssen has a lot of great traits, Janssen also has some weaknesses and concerns. 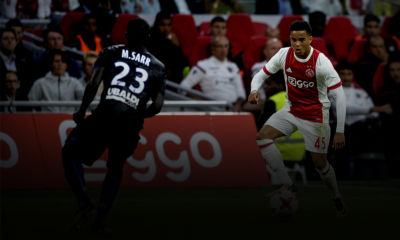 Despite the fact that he starred against the team with the quality that England has, he has the typical concerns of any Eredivisie young talent. Can he do it in the big league with much better competition? And after the way that Memphis has struggled with life England, teams are going to have concerns about Janssen. Another problem for him is his lack of top flight experience, as this is his first season in the Eredivisie. Can the teams trust a player with that little games compared to most top prospects. Besides the experience factor, he also hasn’t had to deal with the pressure of playing on a very big club, as the pressure that is on AZ players is minuscule compared to Ajax or PSV. Would playing at a big club affect his performance? We’ll find out the answer to those questions in the near future for sure. For Janssen to be leading the league in goals despite being only 21 years old is a great achievement that signals how bright his future is. And after the impression he made against England, the big clubs will be looking at him for the next few games. While the temptation to leave might take him to a bigger club, most fans think that he should stay in the Eredivisie. 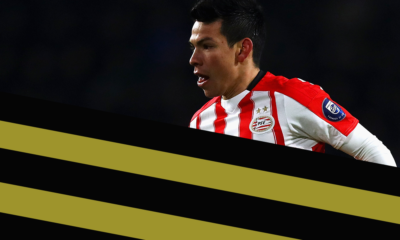 If he’s in AZ or another Dutch club, one more season in the top flight would help him develop even more. If he somehow improves on this season and starts to become a regular for Blind and the Netherlands, he will be an even hotter commodity than he already is. After that, big clubs like Man United that have already shown interest would be a possible destination. And maybe he can get close to doing what his predecessors did, and that would mean one heck of a career.